REVIEW ➤ BMW X6 xDrive M50d: Big, bold, brash and brill! 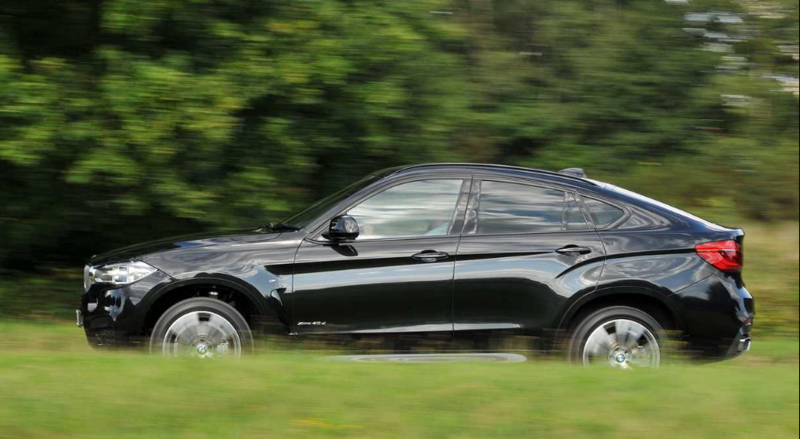 The BMW X6 is essentially an X5 with coupé-like styling. It was conceived to fill a niche that didn't exist prior to its arrival on our shores back in 2008 – before my time as a motoring writer. Its introduction was met with opinions firmly divided on its styling and practicality. However disparaging the UK's automotive media, more than 1,300 X6's continued to find UK homes in 2017. On the more diverse global stage, the X6 was a surprise hit for BMW with almost 290,000 units sold since its introduction nearly ten years ago – admittedly mostly in China and USA. In 2015, the second generation of the low-slung X6 arrived, which again used X5 mechanicals wrapped in a squat, coupé-influenced profile. There's a new BMW X6 expected to debut in late 2019, but I took the current X6 in M50d guise out for a spin, limited stock of which is available here at Concept Leasing. The main bone of contention is the styling. Personally – like the X4, which is a coupé-like version of the popular X3 – I don't have an issue with it. There are space and practicality compromises to accept when choosing the X6 and because of the sloping roofline, there's also no seven seat option either, unlike on the X5. Unexpectedly, it set a styling trend that other marques have been quick to take up, too. Mercedes introduced a coupe version of its GLE just before the second-generation X6 was launched and now offers the smaller Mercedes GLC as a coupe, too. 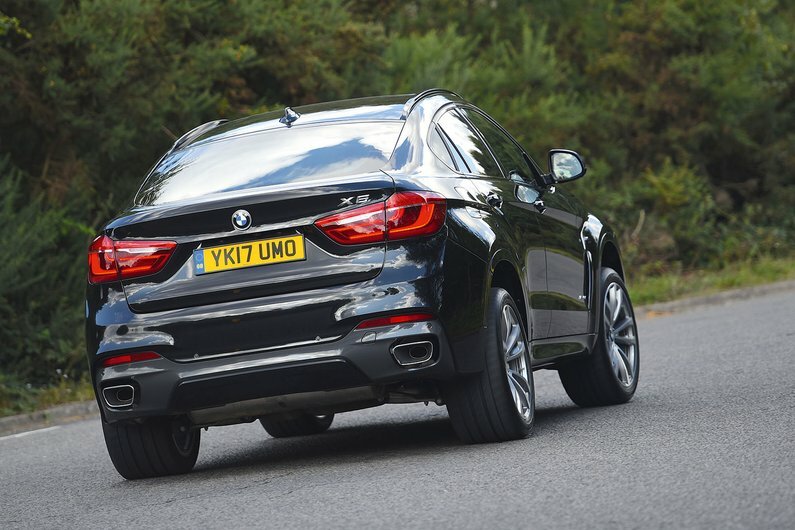 However, despite its curvaceous rear flanks, the BMW X6 remains an SUV and faces relevant competition from more conventionally conceived rivals such as the Porsche Cayenne, Range Rover Sport, Alfa Romeo Stelvio QV and the Audi Q7. The M50d as tested has a particularly more aggressive stance than other models in the X6 line-up, which means it stands out from the crowd and will certainly be noticed as it quickly fills your rear-view mirror. 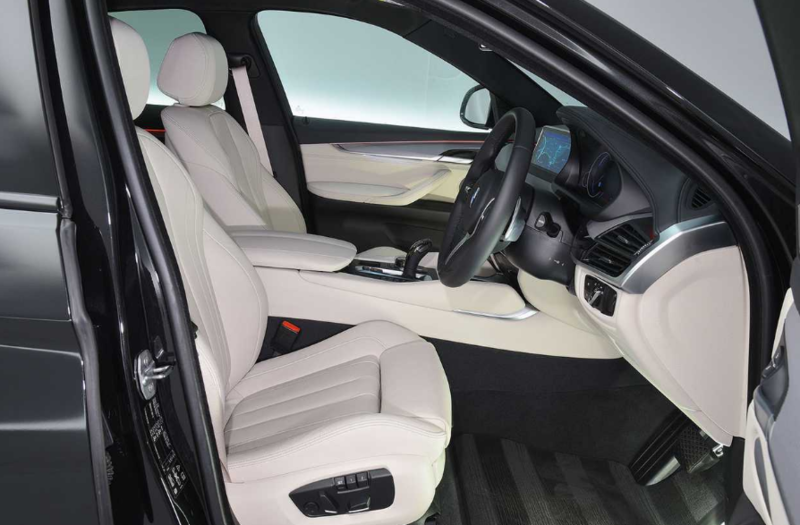 It's not unusual for one BMW interior to look like another. Cost-wise, it makes excellent sense for each model to share as much switchgear and componentry as they can – and it's not a trait exclusive to the Bavarian maker. 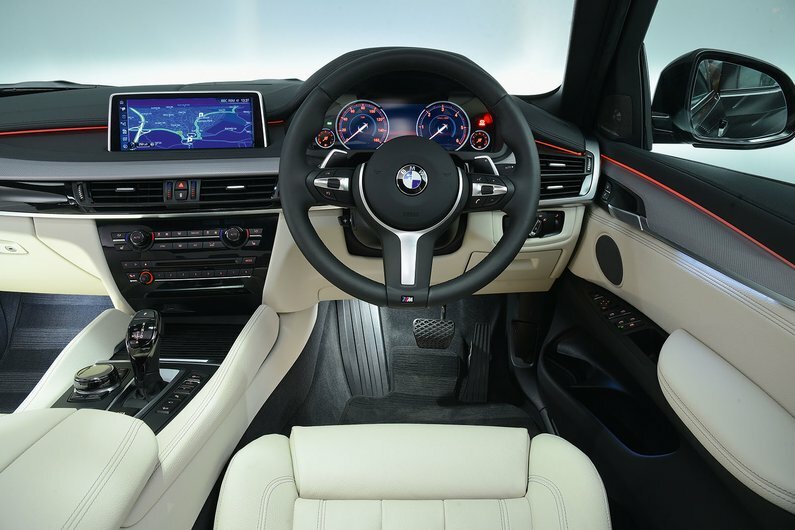 Those familiar with the dashboard of the X5 will feel right at home, because that's what's inside the X6. The whole upper dashboard moulding, instruments, main infotainment screen, climate controls, air vents, wood veneers, glovebox lid – everything – is exactly the same. Even the gear lever and I-Drive controller match, although we will concede their surround is altered thanks to some more aggressive knee-pads on the side of the centre console on the omnipotent X6 M50d. Tick the Comfort Seats option and you'll benefit from some of the best in the business. I especially liked the way the backrest adjustment can pivot halfway up said backrest rather than only from the base – and every adjustment is electric. Should you fail to find a comfortable driving position in the X6, then you're unlikely to fit in any car whatsoever. 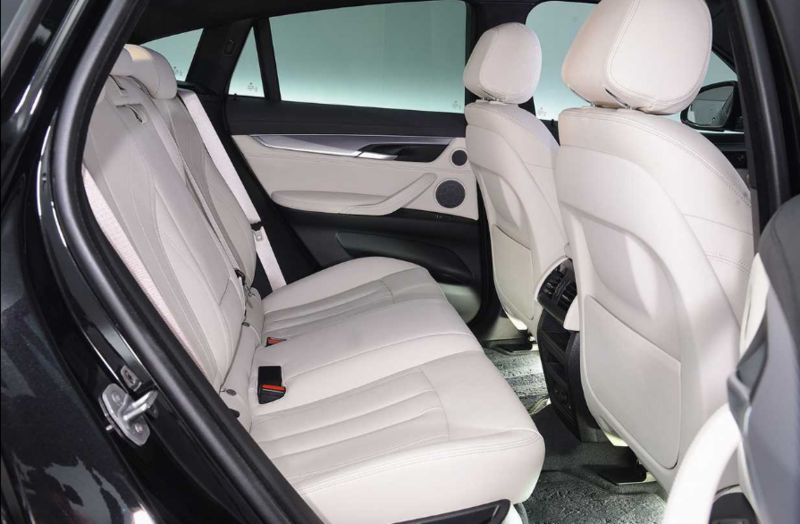 While the X6 shares the X5's interior, it doesn't share its practicality: Adults sitting in the rear seats will feel a bit cramped because the roofline cuts into head room and, while the rear seats now fold 40/20/40 for a bit more flexibility. At 580 litres and far removed from pokey, the boot is still smaller and shallower than you'll get in less coupé-like rivals. Fold the rear seats and that expands to 1,525 litres, which is 345 litres less than the X5, but 75 litres more than the old X6. Rear visibility is still pretty poor, too. 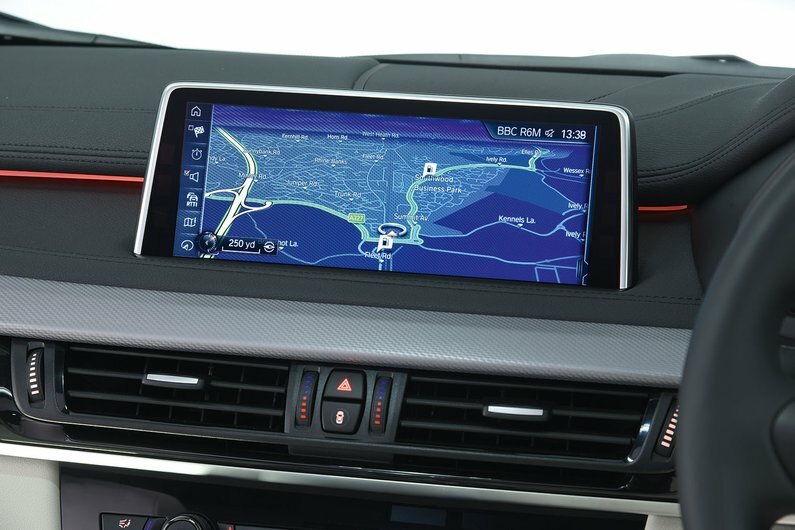 The X6 is better equipped than those aforementioned rivals, with BMW's wide-screen navigation system a particular highlight of the standard kit. Choosing a trim level for the X6 is simple enough with only one main one to choose from – M Sport. It brings with it an aggressive M Performance body kit, 20in alloys, eight speed sport automatic gearbox, adaptive suspension and door sills, while interior luxuries include a widescreen iDrive system, lane departure warning and forward collision mitigation systems, heated front seats and Dakota leather upholstery. On the M50d as tested, there are a few more M Performance touches including a badged gearstick and servotronic steering rack, head-up display and wifi preparation. A fiercer looking body kit and a rear spoiler finish the car off quite nicely. Leaving the questionable image aside, the X6 M50d is far better enjoyed in motion. The familiar 3.0-litre in-line six-cylinder diesel wears two triple-stage turbos to develop 381bhp and a colossal 740Nm of torque. As standard, there's an excellent eight-speed automatic gearbox sends drive to all four wheels and shifts quickly and smoothly. Despite a kerb weight of 2.2 tonnes with standard four-wheel drive, the X6 M50d reaches 62mph from rest in 5.2 seconds, peaking at a restricted 155mph. Fuel consumption on the combined cycle is said to be 36.2mpg, while CO2 emissions are recorded at 205g/km. The M50d enjoys stiffer AdaptiveM suspension and a different steering layout to the rest of the range. Considering its bulk, the X6 is exceptionally good to drive and, as an overall package, it really takes some beating. It offers a measured ride, crisp handling and near-total confidence in all weathers and over all road-based surfaces. Should you take the M50d on track (I didn't), it is likely to display understeer safely beyond its considerable limits, but on normal British A- and B-roads, you'll reach your limit first – I'd wager a fiver on it. 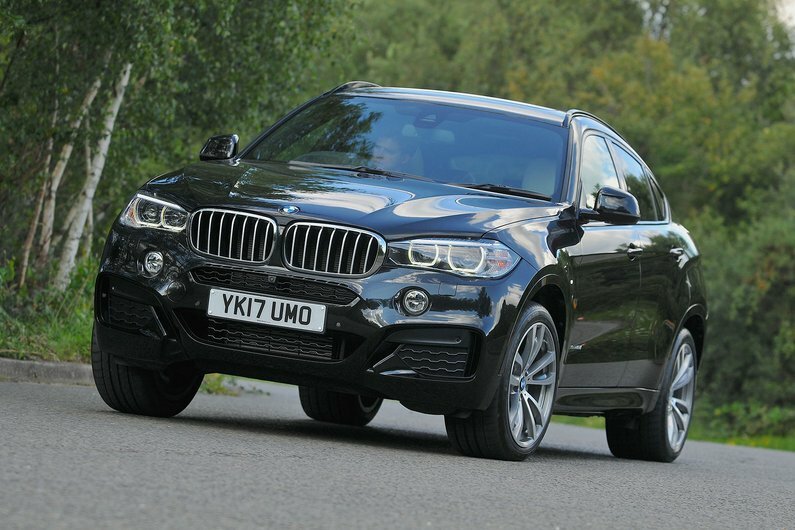 Instilling surprising confidence and stability, this X6 displays some genuine agility for its size. Through the twisty bits, the X6 M50d corners flatter than a Shrove Tuesday treat, shuffling power to whatever wheel can make the best use of it. There's not a lot of steering feel, but it's accurate enough and the brakes never wilt into submission despite the power and weight. For the X6, M50d, BMW really has given it a nuance of driver-pleasing edge, with a truly sporting drive that questions the laws of physics, behaving in a way that no SUV has a right to. The Marmite styling is certainly the most divisive feature of the BMW X6, but looks are a subjective thing. There really is plenty to like about the current X6, especially in M50d guise; technically it stands head and shoulders above what a car of this type should be able to do, with surprisingly nimble dynamics, useful (but limited) practicality and a technologically advanced diesel engine delivers an excellent mix of stonking performance and efficiency. ➤ Check out our special offers on the current BMW X6 M50d here, then call our award-winning Customer Service Team on 0800 043 2050.